A light rain falls Tuesday along a section of rocky shoreline between Sand Beach and Thunder Hole in Acadia National Park where a man is believed to have fallen to his death Monday evening. 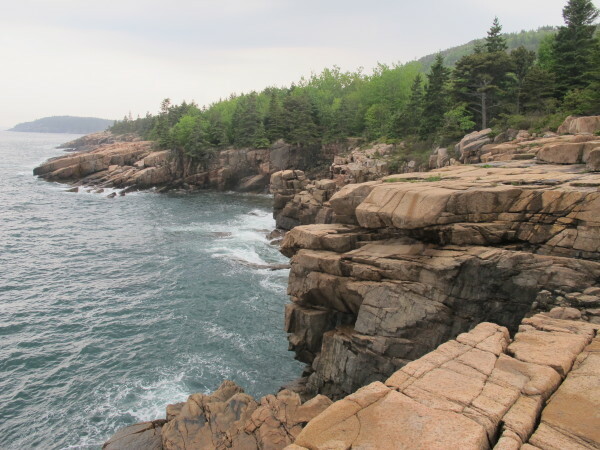 ACADIA NATIONAL PARK, Maine — A New Jersey man died Monday night after falling from a seaside cliff in Acadia, according to park officials. Mark Simon, 68, a resident of Glen Ridge, New Jersey, who spent summers on Mount Desert Island in Southwest Harbor, is believed to have fallen from a cliff near Thunder Hole after going out on the rocks to take photographs of the sunset, Acadia National Park spokesman John Kelly said Tuesday. Simon’s wife stayed in their car in a nearby parking lot when Simon walked to the shore shortly after 7 p.m. to take photographs, Kelly said. After her husband did not return, she waved down a park ranger, who was driving by a few minutes after 9:30 p.m., he added. About a half-hour later, rangers found Simon’s backpack at the top of the cliff, which is about 40 feet tall, Kelly said. They saw him lying at the bottom of the cliff, but he was unresponsive to their calls. Because of Simon’s location, rangers requested assistance from the U.S. Coast Guard and from Mount Desert Island Search & Rescue, but the incoming tide carried Simon’s body offshore, Kelly said. The Coast Guard, which sent two boats to assist in the search, located and pulled Simon’s body from the water around 11:30 p.m.
Simon’s body was taken to the Bar Harbor town pier, then was taken to the state medical examiner’s office in Augusta, according to Kelly. Mark Belserene, spokesman for the medical examiner’s office, said Tuesday afternoon that an autopsy has been performed on Simon but the cause of death is not expected to be determined for at least a few weeks, pending the results of lab tests. Kelly said that though Simon’s fall appears to be accidental, the National Park Service is investigating the circumstances of the incident. Falls are not uncommon in Acadia and, according to Kelly, are the main cause of injury in the park, whether they result in a twisted ankle or a fatality. During the busy summer months, park rangers have been known to deal with multiple simultaneous calls about hikers who have fallen and injured themselves. Most of those instances in which rangers provide assistance involve injuries that are not life-threatening and are considered relatively minor, according to Kelly. The last time someone is known to have died after taking a serious fall in Acadia was in 2012, when a University of Maine student fell off Precipice Trail. It is the second fatality in the park this year. In January, Ellsworth resident Timothy Philpott went missing while hiking in Acadia, prompting several searches over the ensuing days and weeks as weather conditions allowed. His remains were found in mid-April. Belserene said Tuesday that the medical examiner’s office subsequently determined that Philpott’s cause of death was “acute intoxication” from multiple prescription medications.